Early in 1891 George W. Debevoise resigned his position as the Board of Education’s Superintendent of Buildings—a title that translated as on-staff architect. On July 8 of that year the Board would elect his successor, C. B. J. Snyder, the forward-thinking and innovative architect/engineer who would revolutionize public school building designs. But Debevoise had at least one more building to finish. The Board of Education was frantically trying to keep pace with the expanding population of the city. In the past 35 years over eight million immigrants had arrived in New York and the city rapidly pushed northward, taking over rural country estates. One of these was the James Beekman mansion, Mount Pleasant, built in 1763. In 1874 the home’s land value outweighed its historic value and it was demolished. It was on this land that Primary School No. 35 would be built to service the expanding residential district. Although three new public schools were ready for the new school season, one would not be completed until November 1, said the article. That was Primary School No. 35 at 1st Avenue and 51st Street. Debevoise had designed a large and handsome, up-to-date structure capable of accommodating 1,354 pupils. The building alone cost the City $116,207 while furniture and heating brought the total to $134,207. Debevoise had designed a dignified Romanesque Revival structure of buff-colored pressed brick and brownstone. Expansive windows flooded the classrooms with natural light. Carved panels and bands added interest to the four-and-a-half story structure, giving it a decidedly non-institutional look. At a time when the public demanded “fireproof” structures, especially for public buildings, the architect used metal ceilings and iron-and-stone stairways. Because it was a primary school, the ground floor was dedicated to “playrooms.” The three upper floors held the classrooms with the main assembly hall on the fourth floor. Above were the apartments for the janitor and storerooms. Builder Patrick Gallagher received the commission to construct the school. While the quality of his work was, perhaps, excellent, his timeliness was not. He had already missed the opening of the school season when The Times wrote its article; and then the November 1 opening date came and went. Finally around February 1 he turned over the building to the Trustees of the 19th Ward. All that had to be done now was the interior finishing. Throughout February carpenters, varnishers and painters were busy with the finishing details. The Favorite Desk Company was on site installing wood and cast iron desks and seats in the classrooms. On February 19 the work was nearly completed and opening ceremonies were scheduled for March 1. But that opening date, too, would not come about. In order to quicken the drying of the plaster of the walls and ceilings, Frederick Weiss, the “fireman” in charge of the steam heating apparatus, had kept the boilers going for several weeks. On February 19 he left for lunch, returning around 2:45 in the afternoon. Upon entering the building he smelled smoke. Weiss rushed upstairs to find the upper floors of the central section of the school filled with smoke. He ran to the fire alarm box on the opposite corner and, by the time he returned, flames were bursting through the second floor windows. Weeks of constant running of the heating system had caused the fire brought on by an overheated flue. Engine No. 39 arrived and quickly sent out a second alarm. Before long a third alarm was issued. The conflagration was finally extinguished; but not before $15,000 to $20,000 in structural damages had occurred. Not only were the second and third floors of the central section heavily damaged, the enormous amount of water that poured down through the floors caused as much damage as the fire. Ten thousand dollars worth of shiny new furniture, never used, was destroyed. The City had no insurance on the building. And Primary School No. 35 would not open until May. When the new school season began in September, 900 little students, the oldest being only 10 years old, were enrolled. Perhaps owing to the fact that the principal, Mrs. Allen, was now quite aware that her fireproof school building was definitely not, she held fire drills twice a week. The children were trained to file quietly out of the seven exits when the “rapid dismissal” alarm was sounded—four rings of the school bell. At 11:50 on the morning of December 7 Mrs. Allen was in a top floor classroom when the janitor, Patrick Carney, approached her and whispered “The school is on fire. The building is full of smoke.” As he spoke, smoke began seeping into the room. Not everything went with cool discipline, however. “At the big hall leading into First avenue a shout of ‘fire’ was raised by somebody, and the children dashed into the street in a mass. All got out without accident, however, and then Mrs. Allen sounded the signal for the firemen,” said The Evening World. The fire fighters searched for half an hour while the coatless children waited outside. In a rather anti-climactic end of the ordeal, they finally found an ash can of burning rubbish in the playground. By 1897 the school had become Public School 135. 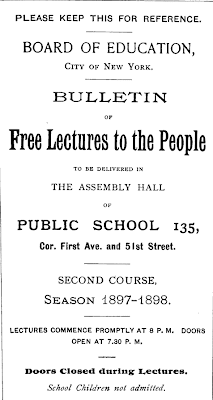 The Assembly Hall served as the site for free public lectures every Monday and Thursday evening. 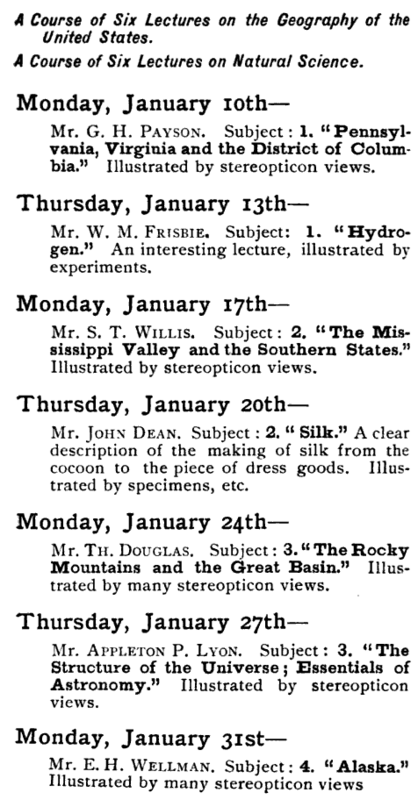 Nearby residents were invited to learn anything from “The National Yellowstone Park (illustrated by stereopticon views) to “The Planet Mars: Is There Life There?” The lecture program continued for years here. 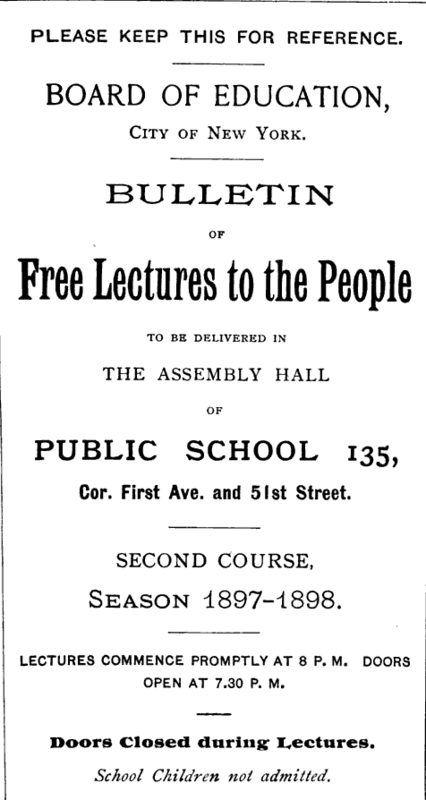 An 1897 bulletin announces the times of the free lectures. "School Children not admitted" was clearly stressed. 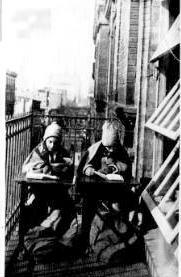 Not only did the Upper East Side continued to grow, but the Compulsory Education Law of 1894 demanded that all children were required to receive schooling until at least the age of 14. By the turn of the century PS 135 was severely taxed for classroom space. In 1902 the City purchased the lot at No. 937 1st Avenue, abutting the school to the north. Three years later, the Real Estate Record and Guide noted that an addition was being built at a cost of $31,773 “ready for occupancy in September” 1905. In November 1906 John Martin conducted a course on “Modern Cities and Their Government” as part of the free lecture program, beginning with a study of the government of London. A year later Dr. Edwin E. Slosson contributed to the program with his lecture that gave updates on the work being done on the Panama Canal. A partial listing of 1897-98 lectures revealed a wide-range of topics. By now classes for the children were not only for winter months. “Vacation school” was available to children and Evangeline Whitney, superintendent of the vacation schools, came to a ground-breaking decision that year. “Physical culture” classes had always been, essentially, gym classes. Ms. Whitney decided to replace calisthenics with dancing. And it worked. Ms. Witney had two ulterior motives in her dance scheme: the children liked dancing better than regulated exercises and they acquired grace. “The children who have learned to dance with very few exceptions seem to have acquired also a certain ease of manner and a knowledge of many little courtesies of which before they had been entirely ignorant,” reported The Sun. If the children enjoyed their summer-time dancing, they may have been less enthusiastic about the winter-time “fresh air” program instituted in 1916. Tuberculosis was a serious threat, especially among the lower classes. Fresh air and sunshine were considered the two major means to battle the disease. In addition the children received vigorous exercise drills every day to strengthen their backs and arms, breathing and stretching exercises on the balconies, and in the morning and afternoon they received a refreshment of crackers and milk. The Tribune happily reported that “The children are healthy, though there are tuberculosis strains in their families.” That the children did not die of pneumonia, instead, is amazing. In 1948 the ground floor of Public School 135 was redesigned as fully-equipped school unit for children with cerebral palsy. After extensive renovations, it became the first New York public school to offer such a facility. The unit opened with 25 students, some referred by cerebral palsy clinics and others chosen from long waiting lists. In addition to classrooms and a lunchroom specifically for these students, the newly designed floor offered a physical therapy room and medical room. A new lunchroom for the existing students was constructed on the second floor. In 1960 a new school, P.S. 59, was constructed about a block away at 52nd Street and 2nd Avenue. The regular students of P.S. 135 were transferred to the new school, leaving only about 50 of the children with cerebral palsy in the hulking building. Later the building was used for a while as the United Nations International School, and then briefly as a private school. But in the late 1970s the Board of Education sold the site to a developer who announced plans to demolish it. Nearby residents were not so quick to accept the announcement. The Coalition to Save 931 (the school’s address) was formed from groups including the Sutton Area Community, the Beekman Place Association, Community Board 6 and the Turtle Bay Association. It succeeded in earning the school a listing on the National Register of Historic Places. Soon the Board of Estimate voted unanimously to support the preservation efforts. Towards the end of 1983 the City again put the school building and land up for auction with the condition that the façade be preserved. For a full decade failed plans came and went, none of which satisfied everyone: the City, the preservationist groups, the neighborhood or the developers. In 1996 developer Dennis A. Herman initiated plans for a luxury high-rise apartment building, incorporating the exterior walls of P.S. 135. Finally in 2004 the 64-apartment, 20-story Beekman Regent, designed by architect Costas Kondylis, opened. The soaring structure tries hard to meld in with the vintage base by means of color and material; but not everyone was pleased. Despite the colossal structure that overwhelms it, George Debevoise’s handsome school house survives, at least in part, as part of the fabric of the Upper West Side over a century after construction. Facadism doesnt always work, just saving the facades and building behind, as shown here with a less than successful result, but on Fifth Avenue adjacent to Harry Winstons jewelers, a row of beautiful early 20th century commercial facades display facadism at its finest. CBJ Snyder would go on and design some of NYC's most beautiful and advanced school buildings. You've tagged this First Avenue building as Upper West Side, rather than Upper East Side. Just FYI.